Situation: Elizabeth, New Jersey-based Coach USA — one of the world’s largest bus companies — selected Hanser & Associates in 2005 to launch Coach USA’s new subsidiary, megabus.com, the first company in North America to offer city-to-city express bus service with tickets sold online. Strategy & tactics: Hanser & Associates planned the launch of megabus.com in April 2006, with initial service from a Chicago hub to/from seven Midwest cities. Then we created and executed an integrated PR/marketing strategy which included media relations, social media, events, advertising and crisis communication to position the innovative company that changed the way Americans travel. 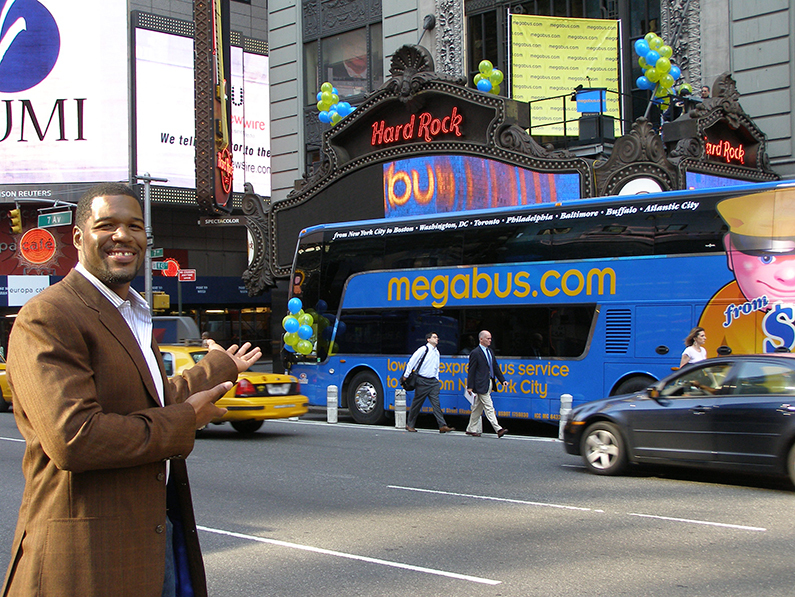 The firm conducted news conferences and launch events in more than 100 cities as the company expanded service (including news conferences in New York’s Times Square, one involving television star and retired NFL champion Michael Strahan); and arranged for media across North America to do news feature stories about consumers’ acceptance of megabus.com and benefits to bus travelers. We also conducted events in major cities across North America to drive word of mouth and engaged potential customers through an event marketing program, created and managed by the firm, conducting 80 events reaching 5 million people in 34 cities annually. The company’s social media strategies, created and implemented by the firm, included Facebook, Google+, Pinterest, Tumbler, Twitter and YouTube to build and engage megabus.com’s online community. We created and placed advertising campaigns (online, TV, radio, print and transit), including megabus.com’s first television commercial that focused upon the benefits of bus travel to consumers. Hanser & Associates also provided PR and marketing services to other subsidiaries of Coach USA between 2006 and 2015. Results: Early demand drove megabus.com to begin expansion in 2007. By 2015 the company served more than 120 cities across North America from 23 hubs in Atlanta, Baltimore, Boston, Buffalo, Chicago, Cincinnati, Cleveland, Columbus, Gainesville, Los Angeles, Memphis, Mobile, New Orleans, New York, Orlando, Philadelphia, Pittsburgh, Richmond, San Francisco, St. Louis, Texas Triangle (Austin, Dallas, Houston, San Antonio), Washington, D.C. and Toronto. Hanser & Associates’ work for Coach USA won 39 international, national and regional awards.